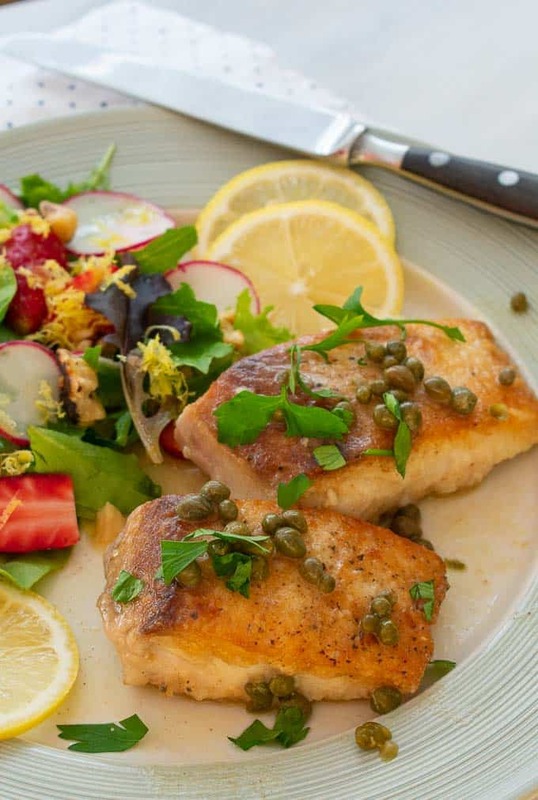 EASY TO MAKE FISH PICCATA IS LOADED WITH GREAT FLAVORS…AND IT WOULD BE PERFECT FOR ENTERTAINING. I think everyone’s familiar with chicken piccata. You can just take the same lemony, butter sauce and apply it to fish. In this case, I used Mahi-Mahi or Dolphin fish which here in Florida is always available fresh. 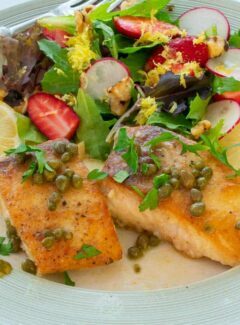 You could really make fish piccata with any variety of fish that you’d like or is available in your area. I like to use mahi-mahi because it is a firm, flaky white fish which is usually fairly thick and easy to fry. One of the neat things about this recipe and fish in general is that it cooks so fast. You could be eating this delicious meal in less than 30 minutes. First thing to do is to prep the fish. The mahi I had came skin on, so you’ll want to remove the skin. To do this, use a really sharp knife on a flat surface and with skin side down, use the knife to get a corner of the skin sliced away from the flesh. Then use your fingertips to hold that flap of skin down and slide the knife, using a back and forth cutting motion, down the length of the filet between the skin and flesh. You should end up with skin and very little flesh. 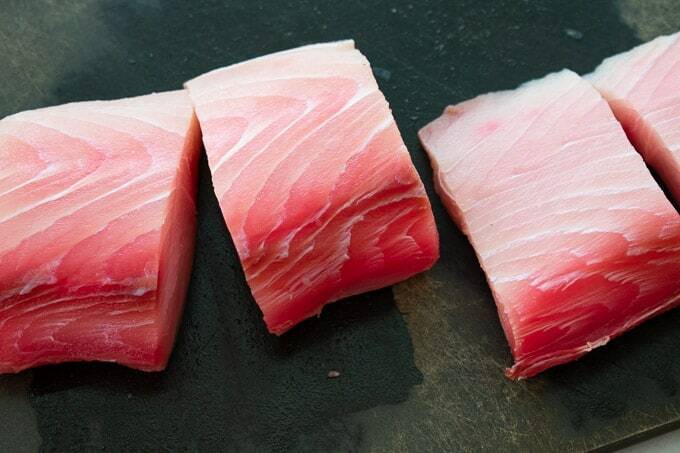 Mahi mahi also has a pronounced bloodline which I generally remove. In the picture above you can see that there is darker meat on one edge. Well that was actually about 1/2 inch of dark red flesh, which is called the bloodline. It generally has a stronger, fishier taste so I remove it. The fish then gets a light coating of olive oil, then salt and pepper on all sides and coated lightly with flour. Fry the fish in your favorite skillet in olive oil and butter on medium high heat. Wait for about one third of the fish to become opaque, flip and fry the second side until the entire filet is nearly opaque. Remove from the skillet. The fish will get finished off in the butter sauce just before serving. Frying the floured fish in the skillet leaves a lot of black, burnt flour pieces so I like to take a paper towel and remove most of that before proceeding making the sauce. Doing this is going to remove a lot of the olive oil and butter, so you’ll have to add another 2 tablespoons of olive oil and 1 tablespoon of butter. Once the butter is melted, stir in a teaspoon of flour…just use the flour from your dredging bowl. Let that cook for a minute then add the broth, lemon juice and capers. Let that cook down to thicken for a couple minutes. Put the fish back in the skillet along with 2 tablespoons of diced butter. Use a spoon to ladle some sauce over the fish to heat it back up, and to melt the butter. 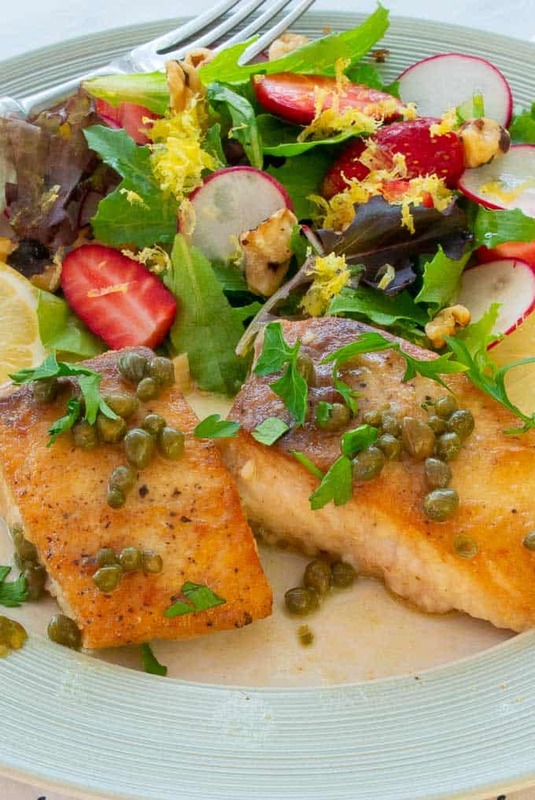 Serve the fish piccata with sauce and capers drizzled over. Accompany it with your favorite side dish. Try it and this may become one of your go-to recipes. Great tasting fish recipe that's easy to prepare. Prepare the fish by removing the skin if necessary. Then lightly coat all sides with olive oil and salt and pepper. Place the flour in a bowl and dredge the fish pieces to coat. 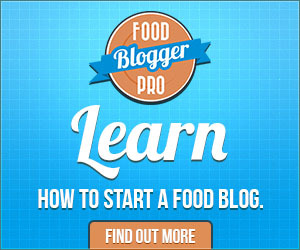 Save 1 teaspoon of the flour to use later. Place a large skillet on the stove on medium high heat and add 1 tablespoon of olive oil and 1 tablespoon of butter. Fry the fish on the first side until about a third of the fish becomes opaque, (2 minutes). Flip and fry the second side until the sides of the fish filet or nearly completely opaque, (2 minutes). Remove the fish from the skillet. Wipe the skillet with paper towels to remove most of the burnt flour and then add 2 tablespoons olive oil and 1 tablespoon butter on medium heat. Stir in a teaspoon of flour and cook for 1 minute. Carefully add the broth, lemon juice and capers. The oil will definitely start to splatter. Bring to a slow boil and stir to thicken, 2 minutes. Lower the heat to low and add the fish back to the skillet along with 2 tablespoons chopped butter. Spoon the sauce over the fish to heat back up and to melt the added butter. Serve hot with the sauce and the side dish of your choice. My mouth waters remembering the sweet mild flavor of the fish combined with the salty capers, smooth butter, and tangy lemon juice. 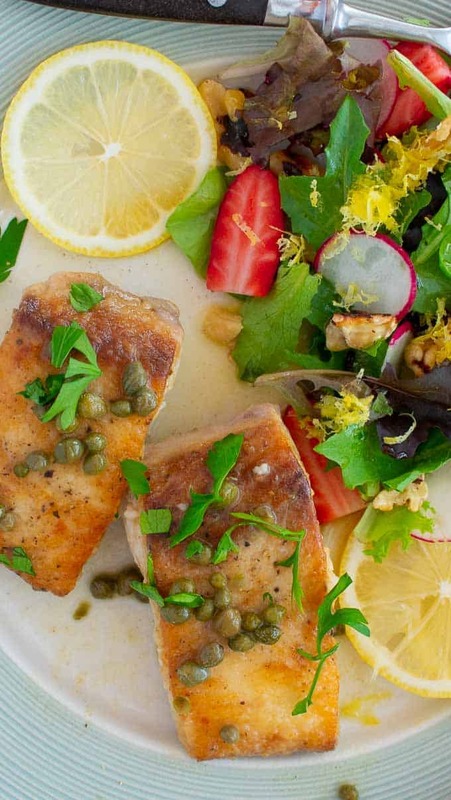 If you like chicken piccata, you really should try this outstanding recipe.